This summer, a pair of young biracial Japanese athletes drew widespread attention, an indication that the nation’s sports scene has entered a new era. Sprinter Abdul Hakim Sani Brown, a 16-year-old born to a Japanese mother and Ghanian father, triumphed in the 100 and 200 meters at July’s IAAF World Junior Championship in Cali, Colombia. In the 200, he was clocked at 20.34 seconds, breaking Usain Bolt’s championship record, and clinched a spot on Japan’s senior national team for the World Athletics Championships in Beijing. 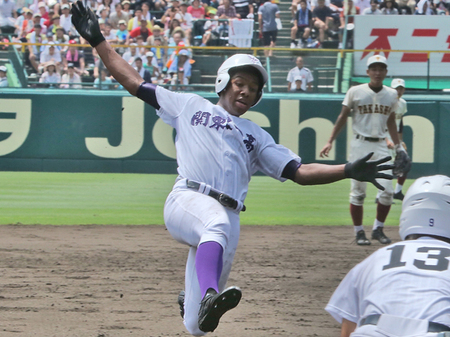 Meanwhile, half-Japanese, half-Nigerian baseball player Rui Okoye, an 18-year-old outfielder for Kanto Daiichi High School, became a sensation at the National High School Championship, which is widely dubbed “the Summer Koshien.” With his sure but powerful hitting and blazing speed, he led the team to the semifinals. At the elite level, perhaps baseball’s Yu Darvish (Texas Rangers pitcher), whose father is Iranian, and Athens Olympic hammer throw gold medalist Koji Murofushi, who was born to a Romanian mother, are two of the more notable biracial Japanese athletes in recent years. But when you take a wider view, you’ll see many athletes similar to Darvish, Murofushi, Sani Brown and Okoye in the country’s stadiums and arenas lately. Here are some other notable examples: Yasuaki Yamasaki (Yokohama BayStars relief pitcher), Airi Miyabe (Kinrankai Girl’s High School volleyball player), Mashu Baker and Ryu Shichinohe (national team judoka), and Rui Hachimura (basketball phenom for Meisei High School). Simply, the number of international marriages between Japanese and foreign nationals have increased, and that’s one of the biggest reasons for the rise of the biracial athletes. In 1965, a total of 4,156 marriages in Japan were between Japanese and non-Japanese, according to Ministry of Health, Labour and Welfare figures. But half a century later, the number has risen fivefold; there were a total of 21,488 marriages of which a groom or bride was non-Japanese in 2013 (2007 was the all-time high with 40,272 couples). So the presence of foreign nationals and multiracial people isn’t such a rarity as contemporary Japanese society has become gradually more open. This holds true in the sporting world as well, as biracial athletes are treated just like the others these days. Basketball commentator and emcee Chris Sasaki was born in New York to a Japanese father and American mother and moved to Japan when he was in kindergarten. He played pro basketball in the bj-league (for the Chiba Jets and Tokyo Cinq Reves) and has performed as a hip-hop musician in the past. Sasaki, who initially played baseball and switched to basketball in high school, recalled that his experiences as an athlete growing up were mostly positive. “All my friends were really close and they were actually looking after me,” said Sasaki, who now serves as an NBA analyst for the Wowow cable channel. Sasaki said at times some kids looked at him like he wasn’t “a full Japanese,” but it wasn’t too hard for him because he knew he had “friends and teammates that were looking out” for him. Running back James Takada Gray, who was raised in Japan and joined the University of Utah Utes football team this year, hasn’t had any painful experiences as a biracial athlete either. Kotaro Matsushima, a quick-footed utility back for the Japan rugby union squad at the ongoing Rugby World Cup who was born to a Japanese mother and father from Zimbabwe, paused for a moment to think if he had any bitter experiences as a biracial child. But then he shook his head, responding that he’s never had one. He said that he couldn’t say that there is no bullying of other multiracial athletes at all, and in fact, he has heard that many of them used to be bullied. But as far as his own experience goes, he hasn’t been subjected to bullying. “I think I was very fortunate and I’m very pleased about that,” said Matsushima, who went to Kanagawa Prefecture’s Toin High School. Matsushima is also happy with the fact that he sees more multiracial athletes in Japanese sports these days. “It’s fun to watch them (multiracial athletes in Japan) and they are all great athletes,” said Matsushima, who added that Okoye was among the mixed athletes who have caught his eye recently. Sasaki said, meanwhile, that sometimes being a multiracial athlete is tough, depending on his or her background and which sport the athlete plays. Because Sasaki is half American and played basketball, which originated in the United States, it automatically raised the bar for other people’s expectations of him. Yet athleticism isn’t the sole thing biracial athletes bring to Japanese sports. Growing up in families with multiple cultures, they bring different mentalities, which could be a positive for Japanese sports. But whether Japan has become fully accepting of multiracial cultures and people today is still debatable.